The moment single mission workers across the world have been waiting for has finally arrived: our new book Single Mission is now available! Being single can bring massive challenges for mission workers. Feeling lonely, isolated or misunderstood, or even being taken advantage of can cause self-doubt, resentment and can even lead to people leaving the mission field. 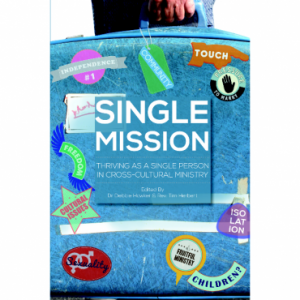 Written by Dr Debbie Hawker and Tim Herbert, Single Mission aims to encourage and equip single mission personnel, and to help them be strong in their faith, effective in their ministry, resilient and content with their lifestyle. The best book about singles I have ever read. Chapters have been contributed by over single 30 women and men from six continents and their stories include issues such as sexual temptation, adopting, the death of a husband after just two weeks of marriage, internet dating, pressure from family and church to marry, and plenty of tips on how to thrive in cross-cultural mission as a single person. Some stories are sad, some are humorous, all are thought-provoking. With chapter headings like Sacred Sexuality, What not to say to single mission workers, Loving and serving God, and Why aren’t you married?, let these stories of modern-day mission encourage and challenge you in your faith. It fills a massive gap. Wow! This book does not hold back on issues not normally talked about! I’m glad to see that you aren’t shrinking away from the more difficult subjects. We will certainly use it as a resource for training, preparing and supporting our mission workers. You can read a review of Single Mission here. Single Mission costs £8.99 plus £2.00 for postage and can be bought in the UK through the Global Connections shop, where you can pay online, or by emailing Tim Herbert. Books are also available to buy online in the United States from Condeo Press and Single Mission is also available as an ebook. All profits will be used to support mission personnel worldwide, through the work of ARREST and Sygyzy.